Often we feel the need to transfer money from our SBI account to another payee holding an account in the same or in a different bank. That is when we must have the knowledge about adding a beneficiary for the transactions to take place efficiently and quickly. Here are a few steps that will certainly reduce your efforts when you have to add a beneficiary. A beneficiary could be linked to your SBI account using your desktop. The beneficiary to be added may be an Intra-Bank beneficiary or an Inter-Bank Beneficiary. How to add an Intra-Bank Beneficiary? Intra-bank beneficiaries are the ones which hold their account in the same bank (SBI). 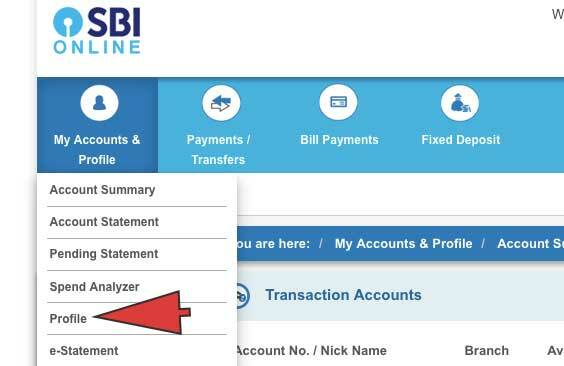 Open SBI- Open your online SBI net banking account by entering the Username and Password. Entre into the Profile section- Click on “My account &Profile” section in header menu. Now, in the drop down menu click on “Profile”. Click on Manage Beneficiary- You’ll see a “Add & Manage Beneficiary” option in the Profile section. Click on it. Click on Profile password-Enter your “Profile Password” to seek permission to manage beneficiaries. Submit- Click on “Submit” option. Select option for Intra-Beneficiary- A page for managing the beneficiaries gets opened. Here you are provided with options to add beneficiaries for Intra-Bank or Inter-Bank. For the present case, click on the option of “Intra-Bank beneficiary”. Enter required details- In the “Add” section of the page, enter all the required details ( Name, Account Number and Transfer limit). The transfer limit sets up the maximum limit to which money can be sent to the beneficiary and it can be modified later according to our needs. Note- Care should be taken that only one beneficiary can be added in a day. Click on Approve- A high-security password will be sent to your registered mobile number. Next, click on the “Approve Now” option. Select the Approval Type- Click on the “Approve Beneficiary” option in “Select the Approval type” category. Click on Approve through OTP- Next you get two options for approval. One is through “ATM” and the other through “OTP”. Here, click on “Approve through OTP” option. Provide the password- Enter the high-security password sent to your registered mobile number. A new Intra-beneficiary will thus be successfully added for transfer of funds from your account. You can modify the details using the “Modify” option or you can delete the beneficiary using the “Delete” option. 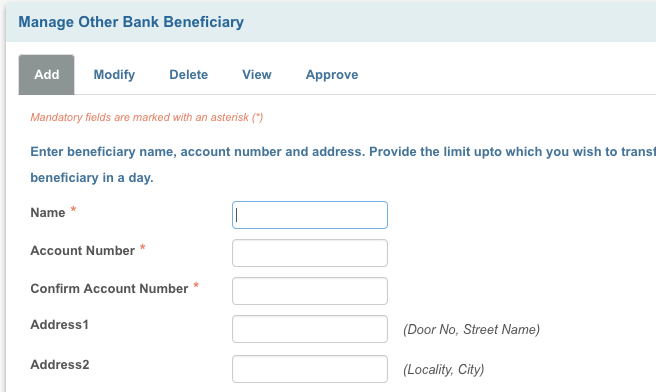 How to add an Inter-Bank Beneficiary on Desktop? Intra-bank beneficiaries are the ones which hold their account in a different bank (other than SBI). Entre into the Profile section-. Click on “My account & Profile” section in header menu. Now, in the drop down menu click on “Profile. Click on Manage Beneficiary- You’ll see a “Manage Beneficiary” option in the Profile section. Click on it. 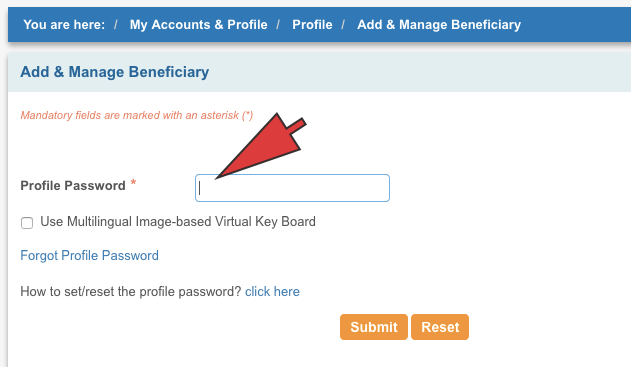 Click on Profile Password- Enter your “Profile Password” to seek permission to manage beneficiaries. Select option for Inter-Beneficiary- A page for managing the beneficiaries gets opened. Here you are provided with options to add beneficiaries for Intra-Bank or Inter-Bank. 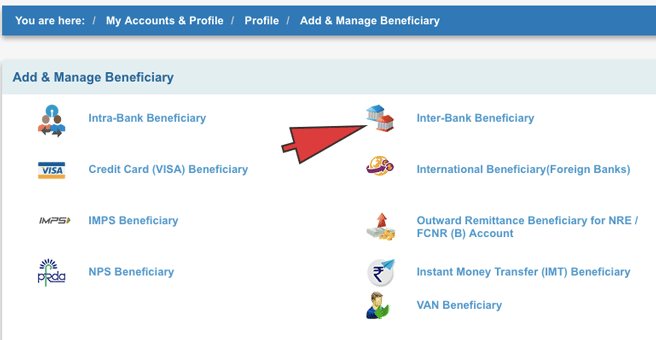 For the present case, click on the option of “Inter-Bank beneficiary”. Enter required details- In the “Add” section of the page, enter all the required details ( Name, Account Number and Transfer limit). Along with these, you need to enter Address 1, Address2 and Address 3 corresponding to Street Name + Door No, Locality + City and State + Pin code respectively. Enter the IFS or User’s location- Click on the IFS code or the location option, whichever you seem to know appropriately about the beneficiary. Submit- Click on “Submit” option after accepting the terms and conditions. Click on Approve Now- A high-security password will be sent to your registered mobile number. Next, click on the “Approve Now” option. Click on Approve Beneficiary- Click on the “Approve Beneficiary” option in “Select the Approval type” category. A new Inter-beneficiary will thus be successfully added for transfer of funds from your account. You can modify the details using the “Modify” option or you can delete the beneficiary using the “Delete” option. SBI allows us to make easy and comfortable transactions using the “SBI Anywhere App”. The app has been launched by SBI for its retail clients to allow them to use their personal account and manage internet banking with the help of their smartphone. Login- Login into your personal account using Easy pin, which can be set easily, or by using your username and password. Tap on Fund Transfer- Click on ‘the “Fund Transfer” option. Tap on Add/Manage Beneficiary- Click on “Add/Manage” Beneficiary option present on the bottom of the page. Tap on Profile Password- Enter your “Profile Password” to seek permission to manage beneficiaries. Tap on type of beneficiary- Select the type of beneficiary you want to add. It could be one having a SBI account or one having an account in some other bank. Provide all details- Enter all the required details like Name, Account Number and Transfer limit. Enter OTP- Enter the OTP received in your registered mobile number. A new beneficiary will thus be added to your SBI account. A message confirming the same information will also be sent to your mobile number.